fresh thyme from my window sill. I decided to let it be accompanied by pasta – big rigatoni! the vegetables were cleaned, trimmed & chopped. I started w/ frying the vegetables in some olive oil & took care not to burn the mix. I plucked the thyme leaves (about 2 tbsp). Once the vegetables were soft I added the thyme leaves. 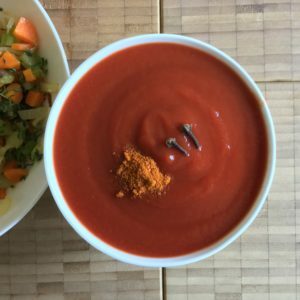 I prepared the tomato pulp by adding a pinch of sugar, a pinch of ground chili & 2 cloves. 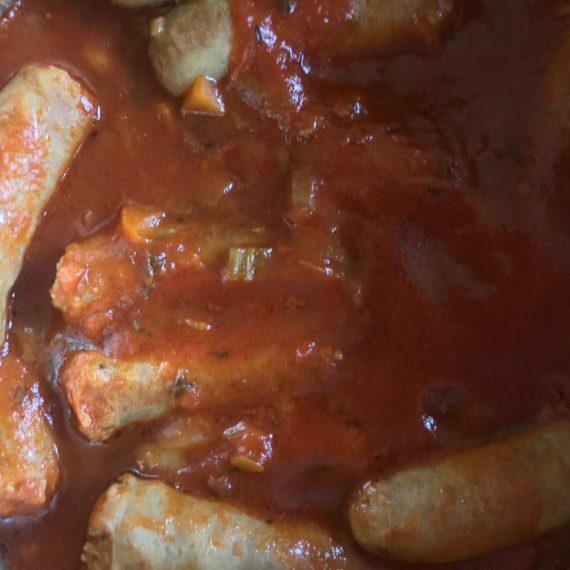 Now the salsiccia is browned…. 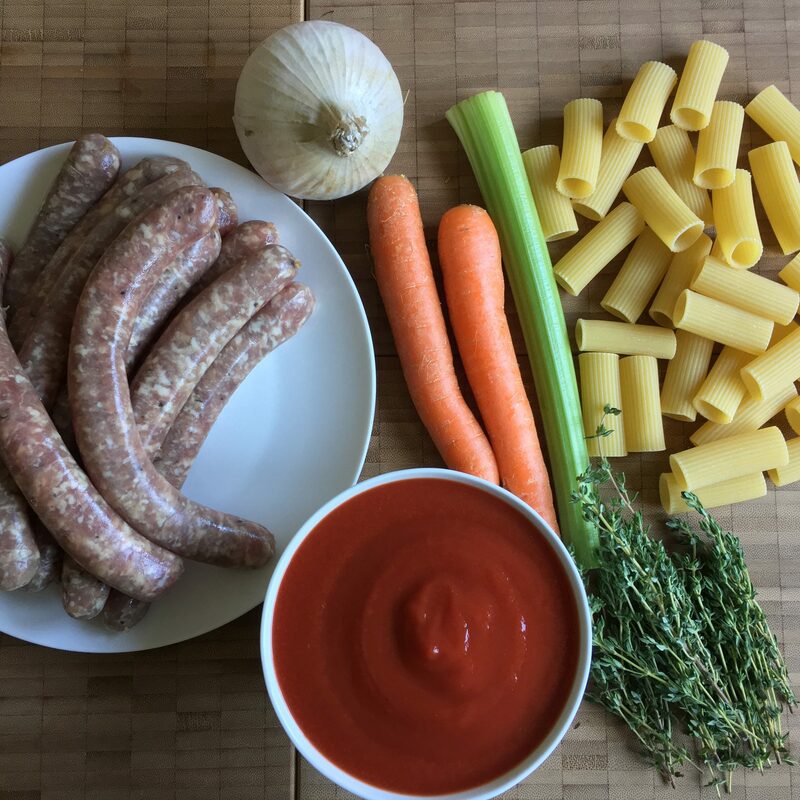 It’s simply some sausages in tomato sauce, however, Italian style: so we’ve got salsiccia in Italian tomato pulp mixed with vegetables and ground chili and lotsof fresh thyme... overall delicious, spicy and tender meat! 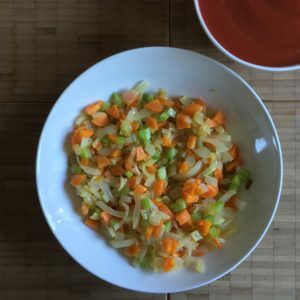 Chop the carrot, the celery & the onion & start frying in the olive oil - careful: don’t burn anything! 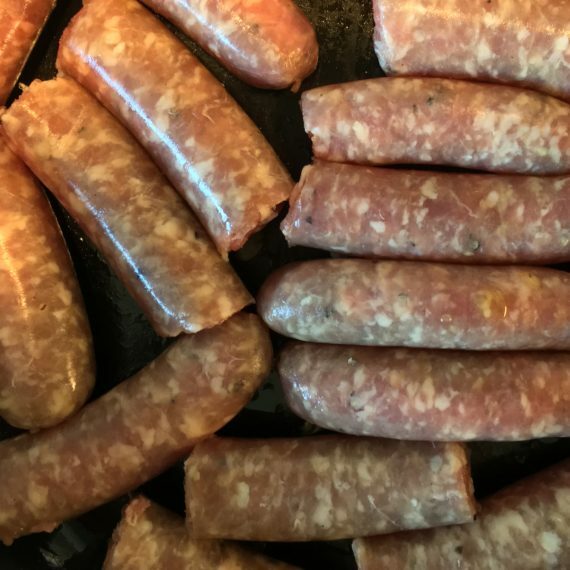 Cut each salsiccia into 3-4 pieces. Add ground chili & cloves to the tomato pulp. 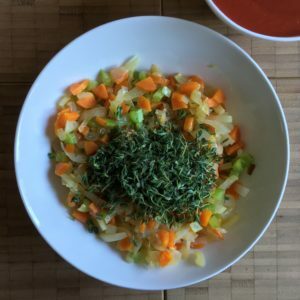 As soon as the the carrot-celery-onion mix is soft (about 10 min frying) put it aside & mix w/ the thyme leaves. Start frying the salsiccia until it's allover brown (about 10 min). 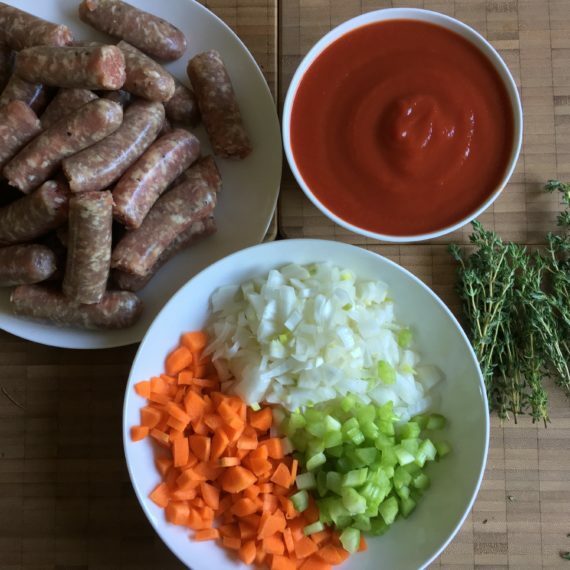 Put everything in a pot: the salsiccia, the carrots-celery-onion-mix, the tomato pulp & mix. Start cooking, however, reduce heat as soon as the tomato pulp starts bubbling. Put a lid on the pot & let it simmer for about 2 h.
Discard the cloves - if you find them. Otherwise give a warning to everybody at the dinner table. Prep Time: It’s chopping the vegetables, preparing the salsiccia etc as well as frying the vegetables & the salsiccia. Cook Time: Simmering the mess until ready for serving. You may store any leftovers in the fridge for up to 2 days. Reheat in the microwave. You may also freeze any leftovers. 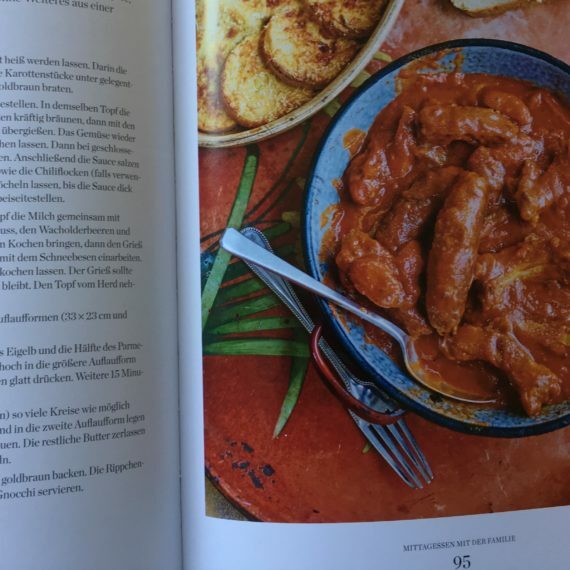 The recipe is for 6 persons based on 1.200 g salsiccia & pork ribs at equal parts. 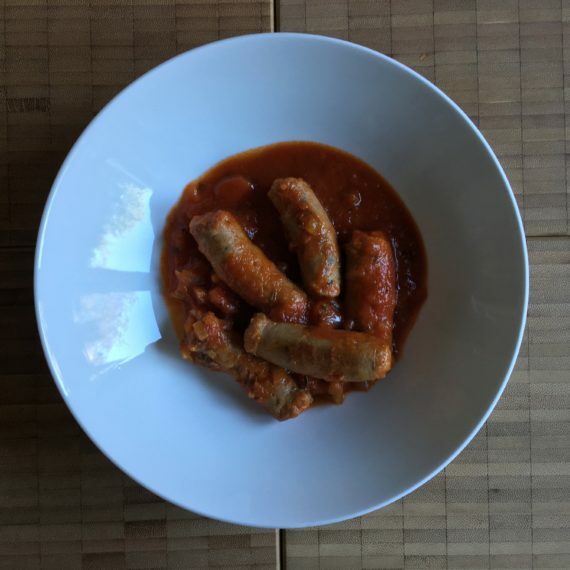 I reduced the meat part to the salsiccia (600 g by recipe). This is a lot for 6 people if you stay w/ the recipe! 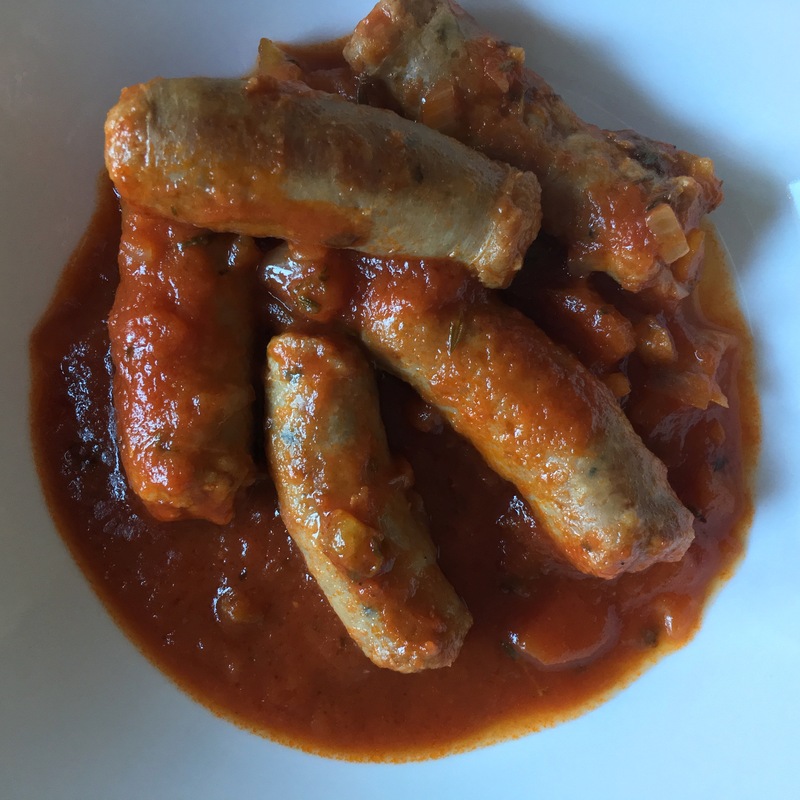 Think of sausages in almost bite-sized pieces, absolutely soft & mellow w/ a spicy flavour that is allover the tomato vegetable mess! 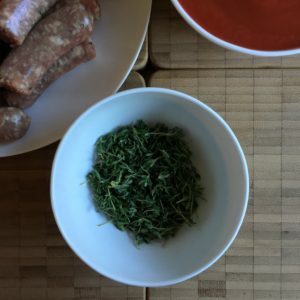 Be careful: you need only very few ground chili because the salsiccia is spicy on its own! 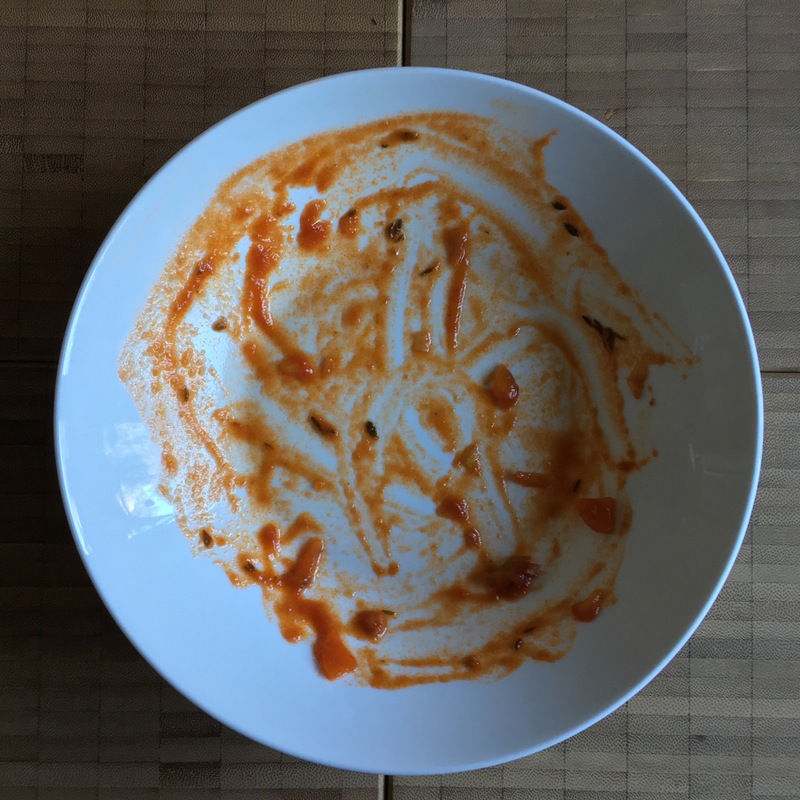 I was surprised how few steps waited to be done for this delicious dish! You get a lot of great soft „meat“ & most of the time you need not care for it (when simmering in the pot…). We had pasta w/ it on the 1st day, stored it in the fridge & had the leftovers w/ some fresh bread 2 days later. Watch out for them – they won’t melt & vanish into the tomato sauce, but stay solid… at least give a warning at the table!